The Copper Promise from debut novelist Jen Williams is likely to appeal to aficionados of Dungeons and Dragons in several ways: not just because of the high fantasy settings, but also because of the emphasis on action/combat; even the trio of central characters bear the hallmarks of a tabletop fantasy RPG: a fighter/mage (Lord Frith), a paladin (Sir Sebastian) and a thief (Wydrin, aka ‘the Copper Cat’). Indeed, the quest they initially embark upon, lending the book it’s title, is into an abandoned/haunted citadel, very much the classic setting of a pencils-and-dice ‘dungeon.’ Nothing wrong with that, as it makes for a fast-moving action-adventure with more than a touch of nostalgia for those fond of straight-ahead fantasy. The book was originally written as a novella, then extended to a full-length novel and the DNA remains visible: the story has a somewhat episodic feel, not always flowing seamlessly between the series of set-pieces but the trump card is the characters. Each of the three is rounded, flawed and unpredictable; their thoughts and decisions are distinctly individual and prone to error in interesting ways. As a group, they are as well-balanced as any RPG party and in the sparky Wydrin there is a truly engaging figure many readers would want to follow through further exploits. Through the interplay between characters, Williams keeps the tone lighthearted pretty much throughout. This not only maintains the pace but gives the book a swashbuckling feel that befits the recklessness of the central trio — despite genuine jeopardy, (for example, a dragon, which might be a god, blazing trail of destruction cross the land), there seems always time for a flippant quip, a nick-of-time intervention or a lucky escape. The tragedies experienced by the characters are also born rather lightly. This is not necessarily a flaw, but rather a testament to the resilience and resourceful of the characters; they do suffer, but their skills, intuition and good fortune veer them away from deep pits of torment and despair. And thus the core strength of the group – it’s ability to find just enough brains, brawn, bravery and bravado (or sheer damned luck) as the situation requires – becomes a core strength of the book: escapes and escapes never become formulaic, every situation seems to have a different solution and it is increasingly fun to find out what will they will do to save the day, and the next day, and so on. 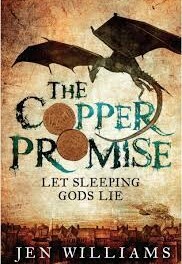 As such the book stands as a counterpoint to the blood-spattered ‘grimdark’ vein of some modern fantasy – there are merits to both styles, but in The Copper Promise, optimism (albeit often misplaced by lead characters), abounds. But there is subtlety too: the portrayal of a key character trait of Sir Sebastian in particular, is handled with tact and sensitivity. For those seeking a rambunctious diversion in a classic fantasy style with plenty of action and characters to root for, this is for you. Disclaimer: reviewer was given an ARC of this book in return for an honest review.